Epson EH-TW5350 review | What Hi-Fi? 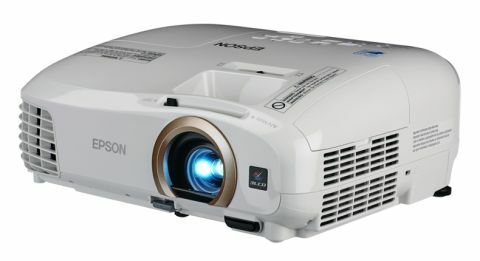 Budget projectors haven’t always won us over, but this talented and compact Epson EH-TW5350 shows that you can get an excellent big screen picture for under £1000. This LCD projector is perfect for those with small rooms and an even tighter budget. While you can get Ultra HD 4K TVs for similar money, it’s not quite the same as watching your favourite film on a giant screen with the lights all turned off. The compact, lightweight body of the EH-TW5350 means you have the freedom to place it anywhere, even take it to different rooms. But the budget price doesn’t mean Epson has scrimped on build quality – the curved chassis is sturdy and smart looking, with a gold-bronze accent around the lens adding some bling. The EH-TW5350 comes with a decent spread of connections on the back panel. You get two HDMI inputs to plug your Blu-ray player or games console into. Epson has helpfully added inputs, such as composite, PC VGA and a USB type A. The projector does have its own 5W speakers, but they’re too thin-sounding to enjoy watching a whole film. We’d recommend using external speakers to get a more solid and enveloping sound with your movies. You’ll need a bit of patience and time to set up this Epson. There are feet to twiddle and adjust to get the picture to the right height, as well as manual zoom, focus, lens shift and keystone corrections to get a perfectly centred and sharp picture. The remote control is nice to use and responds well, but isn’t backlit, which may cause problems in the dark. A claimed 35,000:1 contrast ratio and 2200 lumens means the picture should look bright, but we’d still suggest dimming all the lights down to get the full effect of this petite projector. We start with Edge of Tomorrow on Blu-ray, and as the action gets more intense, we start singing the Epson’s praises. It’s detailed – you can see flecks of mud on Tom Cruise’s hair, the grime on soldiers’ faces and the rough-hewn surfaces as they take refuge in an abandoned cottage. There’s minimal noise across Blu-rays and DVDs alike. In fact, this is one of the most mature budget projectors we’ve seen in a long while. The detail on show isn’t flashy or screaming to be noticed; it’s subtle and allows gradients of colour and texture to be shown. The crispness isn’t overly etched either, giving characters a natural, three-dimensional quality against backgrounds instead of looking like cut-outs. What makes the Epson so comfortable and exciting to watch is that it gets the balance of dark and bright elements in a scene just right. Black depth could admittedly be darker – you’ll find inkier blacks in pricier projectors – but the dark scenes are satisfyingly solid and textured for the price. Next to them, bursts of gunfire and blazing fires from explosions shine bright and intense. Skin tones look natural. The colour palette is well balanced, too, which goes a long way to ensure the EH-TW5350 is an enjoyable, fuss-free watch, regardless of what you throw at it. Another aspect that stands out is motion. The EH-TW5350 is surprisingly stable. When Tom Cruise gets thrown out of a helicopter, the projector handles the zooming, swirling picture without breaking into a sweat. Panning scenes expose a small amount of judder, but we’ve seen high-end projectors that have the same issue. For those who still enjoy 3D Blu-rays, you’re in luck. Even as the majority of TV manufacturers phase the technology out, this Epson projector still supports 3D films. There are no 3D glasses in the box, but you can buy them separately for around £65 per pair. We’re not used to seeing budget projectors perform so admirably. Apart from its rather thin sound quality, the Epson EH-TW5350 delights in every aspect. The handling of motion, contrast and colour balance is skilful and indicative of a level-headed restraint we wish all budget products would adhere to. For just £600, this EH-TW5350 projector brings a bit of the magic of cinema into your living room.